Welcome back to Part 2 of the January Mini Blog Hop with the Wacky Watercooler gang! If you missed Part 1 of the hop, you can catch up with it HERE – but don’t worry, these 2 hops are independent of each other, so it’s not like a sequel, where you have to know what happened in the 1st, to understand the 2nd! We decided to do 2 smaller hops in January, as everyone is usually quite busy; back to school/work after the Christmas holiday, some people wait ’til now to take their vacation, plus for us demonstrators, we have the new Occasions and Sale-A-Bration release. Which is what this hop is all about – we’ll be sharing with you some projects using new stamp sets and products from these new catalogues! There’s nothing like seeing different ways that a stamp or product can be used, before you purchase it. We all like to know that if we commit to a purchase, it’s not going to be a ‘one-hit wonder’. For those who haven’t taken our blog hops before; each of us is linked to the blog before and after us; so all you have to do is click on either the ‘Next’ or ‘Previous’ buttons to go to the next blog. (sometimes there are technical glitches – in which case, you can just click on the ‘Home’ button, where you’ll find a complete list of the participating blogs, and you can pick up where you left off). So you probably arrived here from the amazing Gail Allen’s blog; isn’t she so creative?! I love following Gail’s blog for new ideas! For my first project, I’m going to show you my first card made with the new Botanical Blooms stamp set. I just loved this set when I first saw it; what actually sold me on it was the fact that I could purchase the Bundle which includes the stamp set, the Botanical Gardens DSP AND the Botanical Builder Framelits Dies! I started with a Cajun Craze card base. Then I took a piece of Hello Honey cardstock, and used the fabulous border framelit to cut the leaf shape on an angle, then layered a piece of the Botanical Gardens DSP behind it. I attached both of these directly to the card base. I stamped the smallest flowers in Lost Lagoon ink, and stamped the center in Marina Mist. The medium flowers were stamped in Cajun Craze ink. I used the matching framelits to die cut them, and the flower centers from Basic Black cardstock. For the largest flower, I used the flower framelit that partially cuts the middle of the petals, allowing you to shape them how you want. I think they’re so pretty! I used a Sponge Dauber and Cajun Craze ink to colour in the middle if the flower, then attached the stamen in the middle with a Glue Dot. 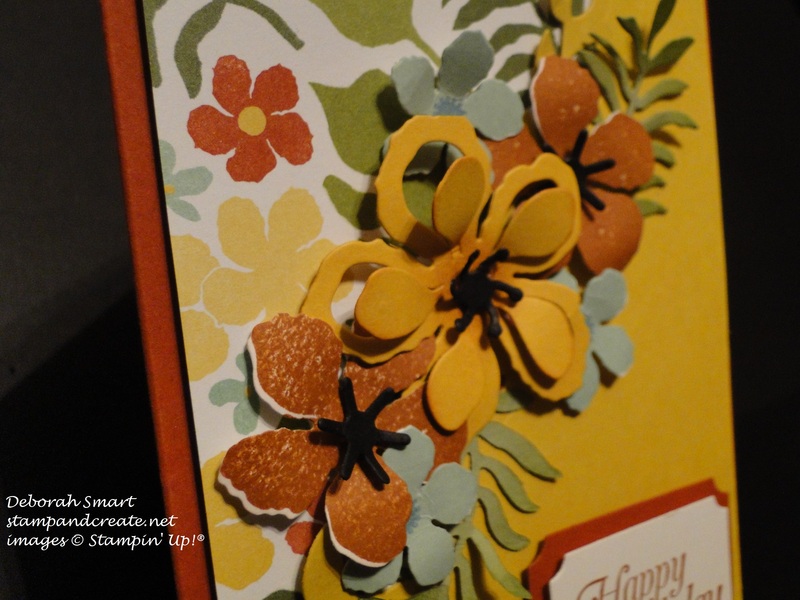 The flower was die cut from (retired) More Mustard cardstock – I chose it as I wanted a slight colour difference between the flower and the cardstock below it. The sentiment is from the Sky is the Limit Sale-A-Bration set, stamped in Cajun Craze onto Whisper White. I die cut it and the bottom layer (in Cajun Craze cardstock) using the Big Shot and the Tags & Labels Framelits Dies. As I said, I only just received this Bundle, so I’ve barely even begun to play with it. I can see a lot more projects to make with it! My next card is using the Picture Perfect stamp set; it has 4 main images – hummingbird, sea star, and rose, plus leaves and sentiments. The main images are 2, 3 or 4 step stamps, which allow you to layer a lot of colour, and achieve a bit more ‘realism’ in the images. I stamped the top sea star first in Crumb Cake, then layered Delightful Dijon, stamped off once. The bottom sea star is stamped in Crumb Cake and Tip Top Taupe. I used the Striped Scallop Thinlits to die cut a piece of the Going Place DSP, wound a few loops of Linen Thread behind the sea stars, and attached it all to a card base of Crumb Cake cardstock that I had stamped in the same colour with the 2 splotches stamps from the Gorgeous Grunge stamp set. The image was stamped onto Very Vanilla cardstock in Lost Lagoon ink, then cut the banner tails using the Banner Triple Punch. You can now click on the ‘Next’ button to head over to see what amazing projects my friend Buffy Cooper has in store for you. I’m sure they’ll knock your socks off! If you’d like to head back & have another look at Gail’s projects, just click on the ‘Previous’ button. Thanks for spending some time with me today – enjoy the rest of the Hop! Deb, lovely projects. I can’t pick a favorite because they are so different and each has it’s own beauty. Fabulous project Deb! You used two of my favorite sets too! Such pretty projects. I am itching to play with the botanicals set. Beautiful job, Deborah! I can’t wait till my Botanicals bundle gets here; your card reaffirms my decision to get it. And your starfish are so pretty. Deb what beautiful projects. Both of them are so inspiring. I really loved the Botanicals one, both for the card design and the colour matchup, and then I saw your starfish card and totally fell in love with that. Thanks for always inspiring! 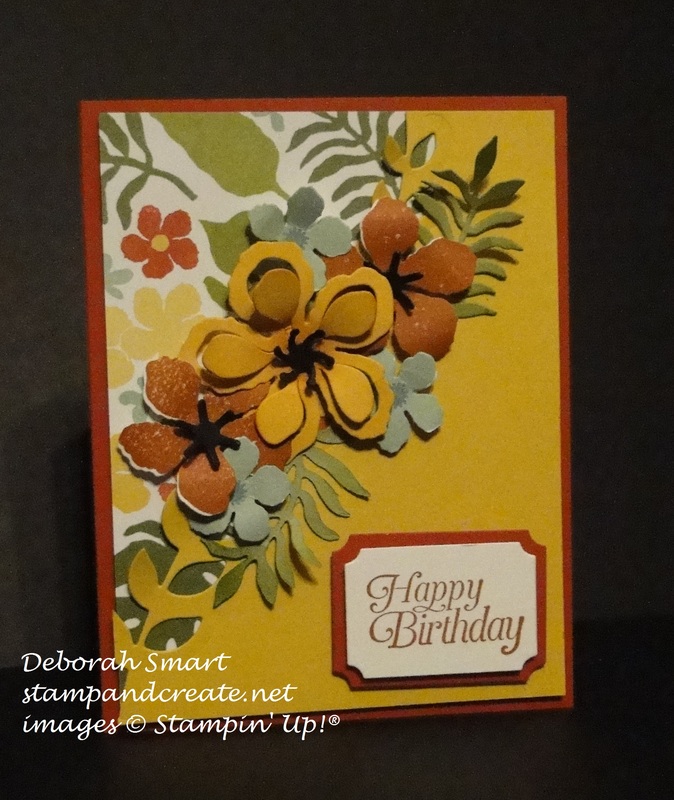 Lovely cards, Deborah! 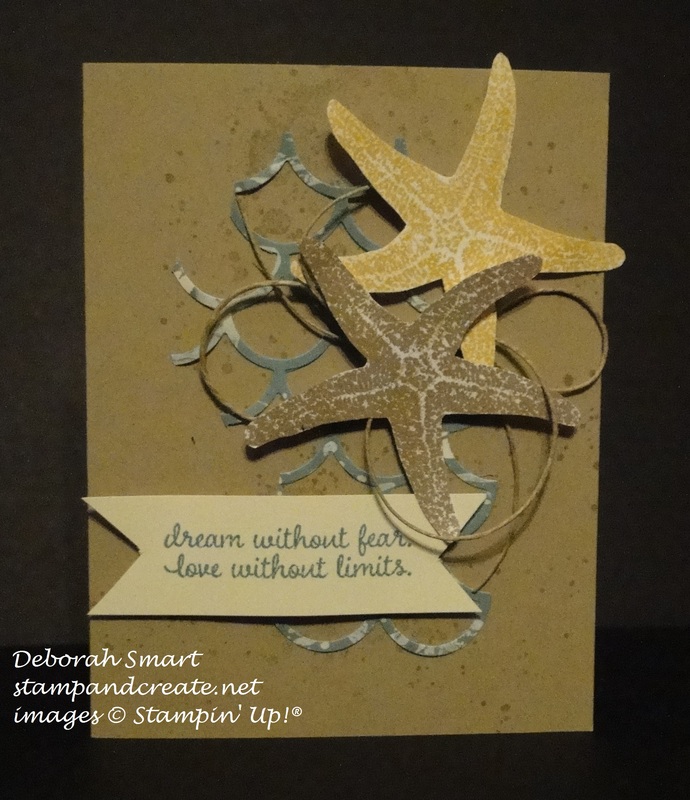 Your starfish card is stunning in it’s simplicity. I really like it. And you’ve given me new ideas for my Botanicals set/framelits–gotta love that border of leaves. Thanks for sharing! Hi Deb, thanks so much for being part of our blog hop. That Botanical Blooms set is wonderful, isn’t it? The colours you’ve used really show it off, especially the combination of Hello Honey and Cajun Craze. Love the style of sentiment from the Sky is the Limit set. Works perfectly for this card. Your starfish card, however, totally took my breath away. You’ve managed to stamp those layers so well—I know that takes practise. The two contrasting colours let them each stand out on their own, too. What a great idea, too, using a portion of the die-cut scallops and the Linen thread as your background. Love it!